Your youthful exuberance blows me away. I bet you hardly notice all of the candles on your cake. Happy Birthday! Folded Size: 4-1/2" x 6-1/4"
Unfolded Size: 13-1/2" x 6-1/4"
You are so kind and level-headed, one would have to be crazy not to realize you're a great mother. Dad, you are the best. 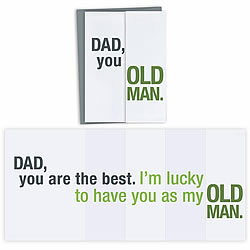 I'm lucky to have you as my old man. I can't thank you enough. You're just the best. 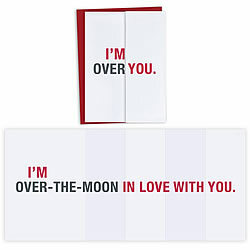 I'm over-the-moon in love with you. Ignore anyone who says romance is over once you marry. 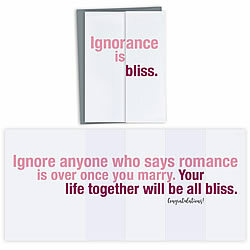 Your life together will be all bliss. Congratulations! 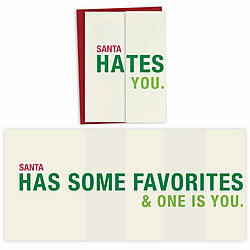 Santa has some favorites & one is you. You are awesome and wonderful. You are awesome & wonderful. Will you be my bridesmaid? You know, I owe you a thank you for giving me a childhood with everything I could possibly want. I can't think of any one thing I missed out on. You look younger than me. I should be jealous, but I'm not. Happy Birthday!